Untersteller’s aim is to “take a pioneering role in the energy transformation.” To achieve that aim, he clearly relies on electric cars to be the driver, whereas he has not been satisfied with the role that the German automotive industry has played so far: First, the minister noted that “Tesla has left the German competition behind.” Then, the Green Party politician added that he had ordered an electric car offering a range of 240 km, but voiced his regrets that the vehicle had not been manufactured in Baden-Wurttemberg. He also elaborated on the state program Heat Transformation in the Boiler Room, which has led to 180 requests so far. The program, however, was discontinued at the end of September 2015 because a federal subsidy program was planned to take its place at the beginning of this year (see the interview). There was a remarkable speech by Dr. Klaus Bonhoff on the evening of the first event day. It was remarkable in two ways: On the one hand, it has to be duly noted how the current NOW President managed to properly finish his dinner speech despite the ever ongoing loud mumbling filling the room, which seemed to leave the impression that no-one was listening to him anymore. Actually, the fault may have more likely been the extremely bad acoustics of the Old Riding Hall at Stuttgart’s Maritim Hotel. On the other hand, the ones who did listen were able to hear how Bonhoff cautiously announced “a new ten-year plan.” According to his statements, the ministerial department was about to establish the regulatory framework for their own program in order to introduce fuel cells to the market until the end of the year. A unique sight was the joint booth together with The Netherlands, the partner country from whose North Brabant region companies showcased their products in Hanover. One of the things on display was the electric bike STORM Pulse (see figure 1). 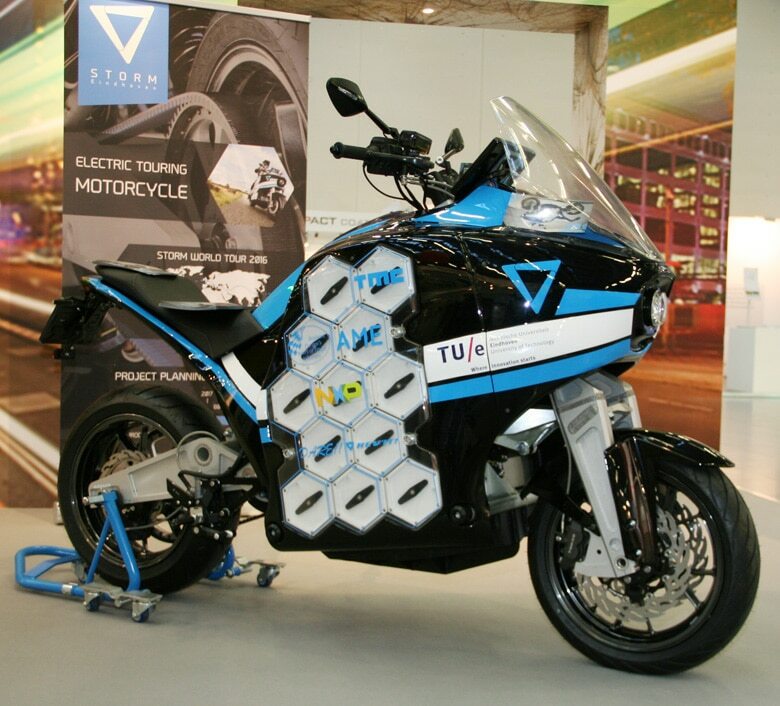 Young engineers from the Eindhoven University of Technology designed this electric motorbike, which is said to have a range of 380 km, in less than a year. 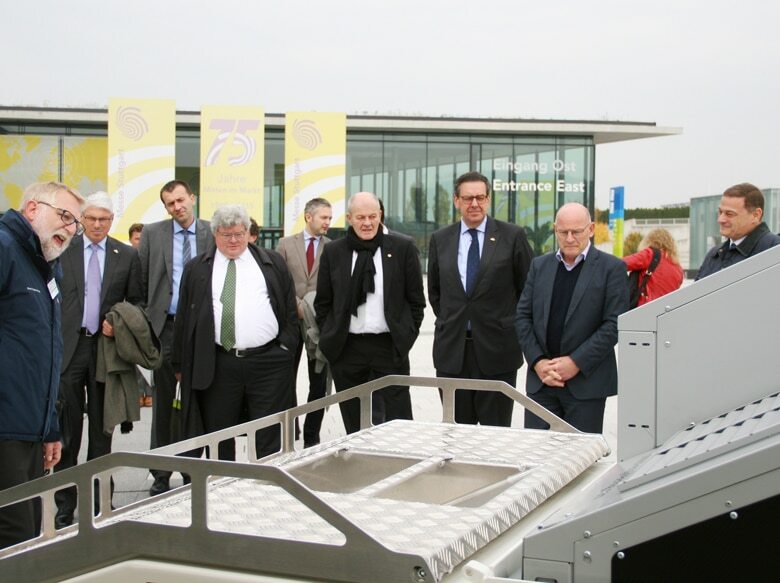 Where visitors entered the trade show, Bosch Engineering presented its baggage tractor, which had been equipped with a fuel cell for range extension during the subsidy project Innovative Regenerative Onboard Energy Converter (InnoROBE). According to company information, the tractor unit with a fuel-cell hybrid engine would be tested at an airport in 2016, although it wasn’t clear yet at which airport the tests would be conducted. The f-cell Award research & development went to the Institute for Microsystems Engineering or IMTEK at the University of Freiburg. There, under the auspices of the MEMS Applications Development department headed by Professor Dr. Roland Zengerle, the young talent group Porous Media simplified the manufacturing process of membrane-electrode assemblies. As the doctoral students Matthias Breitwieser and Matthias Klingele explained during the award ceremony, they had just been “brainstorming” for their doctoral thesis and thought about how to “print” membrane material directly onto the electrode. The first idea was glass and then a direct print onto the electrode. They added that the process “worked at first try.” The colleagues from ElringKlinger liked the coating used to “spray” the PEM membrane directly onto the micro-porous carrier layer (the gas diffusion layer) so much that they immediately agreed to a first meeting with the students on the day after the award ceremony (see figure 3). On the afternoon of the second event day, the e-fleet was showcased at the nearby airport; read more. One highlight of the event was the presentation of a new hydrogen aircraft called Hy4 by the German Aerospace Center (DLR); read more. Matthias Breitwieser and Matthias Klingele presented their prize idea during the WES event and have written about it here.